April 7, 2010 – Continuing to advance the implementation of its wildlife conservation plan, Power Company of Wyoming LLC this week began a significant multi-year greater sage-grouse monitoring program at its wind power project site. Forty female sage-grouse on The Overland Trail Cattle Company ranch are being tagged with lightweight GPS devices that will provide scientific data and insight into seasonal habitat uses by the species. The tagged sage-grouse will come from both within and outside of the proposed development area for the Chokecherry and Sierra Madre Wind Energy Project. Seasonal usage in the early stages of the monitoring effort will serve as a pre-development baseline to which future use of the wind development area by sage-grouse can be compared. 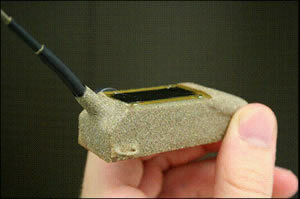 Sand-textured paint applied to actual PTT-100 30-gram solar Argos unit that will be used in this monitoring program. Note that the photovoltaic cell on the top of the unit will be covered with a non-reflective surface to reduce glare and visibility by predators. Designed by expert wildlife biologists at SWCA Environmental Consultants, the tagging and monitoring program uses proven capture techniques, established industry protocols, and GPS technology successfully deployed in other state wildlife programs. It is just one element of a comprehensive wildlife conservation plan that PCW and TOTCO have submitted to state and federal agencies to guide conservation measures accommodating ongoing ranching/agricultural operations and wind development. The tiny GPS tags weigh the equivalent of five nickels and a penny, have a mini photovoltaic cell to recharge internal batteries for up to 5 years, can be quickly deployed with minimal stress to the birds, and are designed to minimize visibility to predators. They record altitude, heading and speed that identify migratory pathways and overall use of the landscape. Identify the factors that determine use of an area by sage-grouse. Help determine locations for additional conservation and habitat improvement projects. Monitor the success of conservation and habitat improvement projects. Demonstrate the relative use of the wind development areas to enable a better understanding of how grouse in the assessment area and populations as a whole respond following wind project development. “Coupled with our conservation measures, this solid, science-based monitoring program will ensure we’re achieving our goal of a net conservation benefit to sage-grouse,” Miller said. Installing dozens of bird diverters on the guy wires for all new meteorological towers, which are located on the ranch to gather vital data about the wind resources. Diverters are intended to reduce the potential risk of collision and avian mortality. Marking fences across the ranch to reduce the potential risk of sage-grouse mortality. Identifying fences across the ranch to be moved or eliminated altogether. Identifying ranch roads to be closed and reclaimed. Designing metal-mesh bird ladders to be built and installed in stock tanks across the ranch, making it easier for sage-grouse or other species to obtain drinking water while also reducing the risk of drowning. Power Company of Wyoming LLC is a wholly owned affiliate of The Anschutz Corporation, a privately held company based in Denver. Through its affiliates, The Anschutz Corporation has been actively involved in the West for more than 70 years in the field of natural resource development. The Anschutz Corporation’s activity and investments in the energy field reflect a strong commitment to responsibly developing and managing natural resources. For more information, visit www.powercompanyofwyoming.com. BLM Wyoming cites PCW efforts in its BLM Fact Sheet about "ongoing collaborative sage-grouse conservation initiatives." A video overview of PCW's wind power project is now online.